Pools, pools everywhere! When temperatures in the Nevada desert soar above 100 degrees, the pool is the best place to be in Las Vegas. Whether you are sun worshipper, an Olympic swimmer or someone who simply enjoys lounging by the pool, getting fit and cooling off is a summer tradition. We can’t possibly cover all of the wonderful pools in Las Vegas in one issue so we decided to count down our four favorite luxury pool experiences in this desert oasis. Remember, call ahead and check admittance policies and pool fees (yes, some pool experiences require admission, even to hotel guests). We will get to our favorite economy pools sometime later. But in the meantime, enjoy learning about our four favorite luxury pool experiences. Want to get in your workout and then lay low the rest of the day? The Venetian’s Azure Pool should be your destination of choice. The Azure is actually two pools, so pick the one that you like best and enjoy one of the 11 private cabanas. Each cabana is outfitted with a large flat screen TV, air conditioning, a stocked refrigerator and video games. What a way to train for your next swim meet! The Bare Pool is, well, once again two pools that offer guests the opportunity to get cooled down and then relax among the tropical elegance of The Mirage’s most exclusive pool setting. Take note – this is a European-style sunbathing experience so tops are optional. The expertly trained staff will take care of all your needs as you enjoy their six cabanas nestled among 14,000 square feet of tropical paradise. Why swim in a mere pool when you can exercise at a beach club? Encore has its own version of the beach with its exclusive Beach Club. 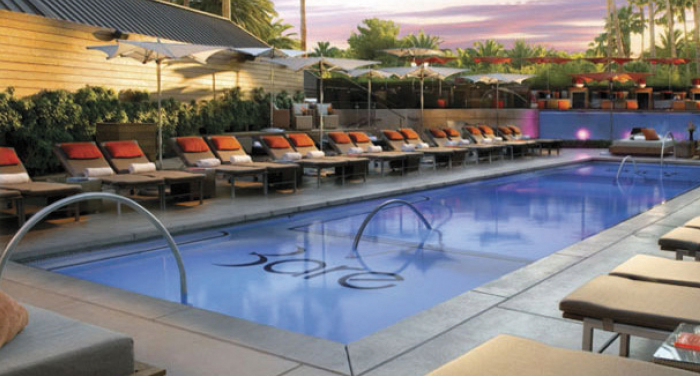 Twenty-six luxurious cabanas and eight bungalows (yes, bungalows) make Encore’s Beach Club one of the best pool destinations on the strip. OK, you may not get to run on the beach, but hey, sometimes relaxing on a daybed is more fun. The folks at Caesar’s claim that the Neptune Pool with its eight cabanas attracts the beautiful people. If you are one of the beautiful people (or if you just want to hang with them) then the Neptune Pool may be your new favorite swim stop. Just one of several pools, the Neptune is part of Caesar’s Garden of the God’s Pool Oasis. The Neptune offers you the perfect chance to swim and tan in one of the world’s most decadent cities.